The beautiful month of August brought some beautiful memories and yet another beautiful box from Team- My Envy Box. Continuing their legacy of designing beautiful boxes, team Envy box came up with yet another White-Lavender Oriental Rose designed box. Is it French Or Oriental? Not sure except the box for this month was indeed a sweet deal. To know what came inside my August MEB, do check out my unboxing video if you have not already. Nothing in general/ particular. The box was beautifully designed, packed and delivered. Value For Money: At the MRP of Rs 850/ month for the box, you will get products worth Rs 2000. 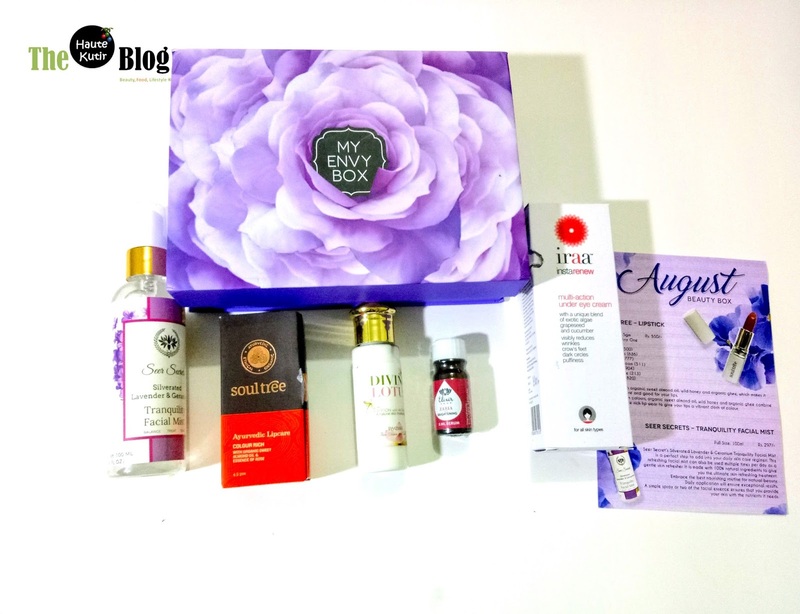 Haute Kutir Verdict: The box this month had some interesting mix of products starting from a face mist to an eye cream, a hand lotion, face serum and a herbal lipstick. The products are select and not just any random drugstore brands. Overall, I liked this month's box and would def recommend it.